It is not often that Andy Murray plays second fiddle to a fellow countryman at a Grand Slam tournament, but Dan Evans upstaged the world No 1 in spectacular fashion here today at the Australian Open. Both men reached the third round, but it was Evans who stole the show with his stunning 3-6 7-5 6-3 6-3 victory over the world No 7, Marin Cilic. Murray, meanwhile, brushed aside the Russian teenager Andrey Rublev, winning 6-3, 6-0, 6-2 to earn a third-round meeting with Sam Querrey. 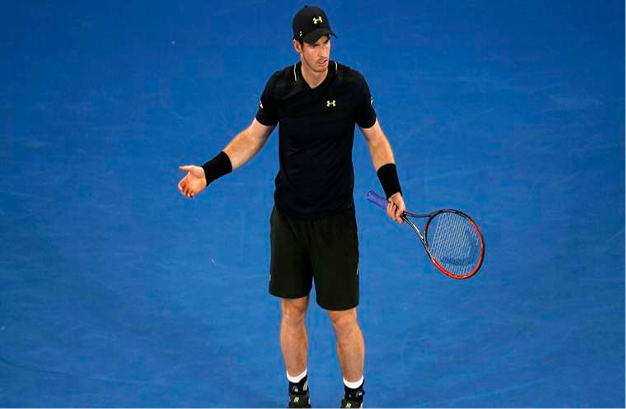 While Murray was setting about his task in Rod Laver Arena, which is the main show court here at Melbourne Park, Evans was completing the finest victory of his career in the comparative outpost of Court 3. For followers of the world No 51, his victory was not a total surprise. Last week Evans beat Dominic Thiem, the world No 8, and went on to reach his first tour final at the Sydney International before losing to Gilles Muller. Over the last 18 months the 26-year-old from Birmingham has climbed more than 700 places in the world rankings and troubled some of the world’s best players. He had a match point against Stan Wawrinka, the eventual champion, at last year’s US Open. This latest victory, against a player coached by Jonas Bjorkman, who used to work with Murray, was a tactical master class. From a set and a break down, Evans stuck to a clever game plan that enabled him to outfox Cilic, a former US Open champion. Evans has played a more aggressive game in his rise through the ranks but on this occasion he chose a different strategy. Cilic, who uses his 6ft 6in frame to hit some huge serves and ground strokes, is at his best when opponents hit the ball hard, but Evans regularly took pace off his shots. Forced to generate his own power, Cilic hit plenty of winners but made even more unforced errors. Nevertheless it had seemed in the early stages that Evans might suffer the same fate that he had in losing the Sydney final last weekend, when he was unable to handle Muller’s big serve. Cilic hit six unreturned serves in his first two service games and for good measure broke Evans at the first attempt. When the Croatian took the first set in just 33 minutes it seemed that the end might be swift. Cilic also made the first break in the second set, but Evans’ ploy soon started to pay dividends. The Briton broke back to level at 3-3, saved three break points when he served at 5-5 and then broke again to take the set. He went to set point with a superb backhand cross-court pass winner before Cilic’s missed forehand completed the job. The momentum was now with the world No 51, who made the only break of the third set to lead 3-1. Cilic saved two set points in holding serve for 3-5, but Evans served out to love in the following game to put himself firmly in charge. Cilic, nevertheless, was not going to go down without a fight. The Croatian, a former semi-finalist here, forced eight break points in a marathon second game at the start of the fourth set, only for Evans to save them all. Rubbing salt in the wound, the Briton broke serve in the next game, with Cilic double-faulting on break point. With nerves perhaps starting to jangle, the next two games also went against serve, but Evans, who had never won a match in the main draw here until this week, broke the pattern by holding to lead 4-2. Evans did not even have to serve out for the match as Cilic went 0-40 down when he served at 3-5. The world No 7 saved the first two match points but on the third he netted a forehand to hand Evans a famous victory. Murray, who had made a patchy start to his campaign in beating Illya Marchenko on Monday, was in much better form against Rublev. The Scot converted his only break point of the first set in the sixth game and raced through the second set, though his progress was halted in the third when he suffered a heavy fall at the back of the court. He called for a trainer after hurting his ankle but recovered to see out a comfortable victory.